While many mothers of toddlers are still suffering from a lack of sleep, that doesn’t have to be the case. Most children are able to sleep through the night by 4 to 6 months of age. By age 2, children should be sleeping, on average, 9 to 10 hours per night without issue. If your toddler is having trouble sleeping, consider taking these three steps to help her improve her sleep. Toddlers thrive when there is predictability, routine and structure incorporated into their day. Start your evening routine off with dinner. Dinnertime should signal to the kids that their day is winding down. After dinner, give the kids a bath and allow them to engage in quiet play, and then head to their rooms for books and goodnight. Avoid prolonged goodnights and don’t fall for the “just one mores.” Instead keep the goodnight short and sweet, for example, have your child blow you kisses as you catch them while walking out of the room. For children preschool aged and younger, lights out should be between 7:00 and 7:30 pm, no later. 2. Set the stage for sound sleep. Your child’s room should be dark and cool. Set the thermostat no higher than 69 degrees Fahrenheit. The ideal room temperature for children should be between 67-69 degrees F. Consider using a safely placed fan or ceiling fan throughout the year. In addition to providing white noise which can help with sleep, fan use has been associated with a decreased risk of Sudden Infant Death Syndrome. Be sure your child’s sleep area is safe and consider using a sleep sack, rather than loose blankets in your toddler’s bed. Your toddler’s room should also be childproofed, should he climb out of his crib or bed. While babies seem born to sleep, as they get older, establishing solid sleep habits and patterns for your child is vital. Children need to learn how to self-soothe, fall back to sleep and stay in bed. When children don’t learn these things on their own, sleep training can be beneficial. While many people confuse Dr. Richard Ferber’s Ferber Method as a cry it out method of sleep training, that’s simply not the case. Regardless of what method you use to sleep train your toddler, crying is likely to be the side effect when the child doesn’t want to go to bed. Dr. Ferber’s book, Solving Your Child’s Sleep Problems, is a great resource for all parents and provides amazing insight into children’s sleep and simple steps you can take to help your child sleep better. With a little effort and a lot of consistency, sleepless nights can be a thing of the past. 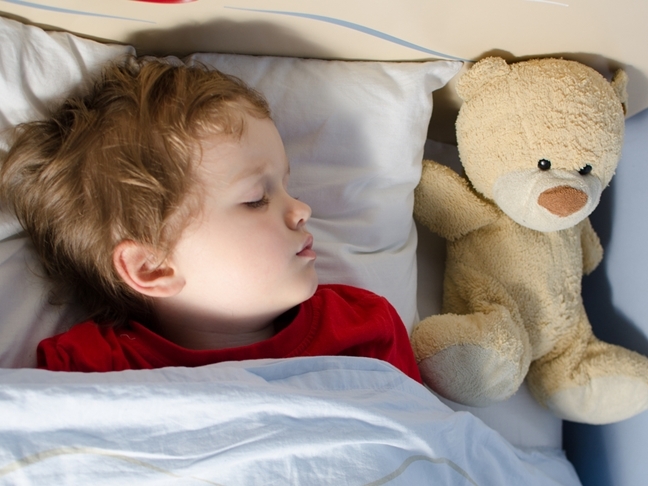 If your toddler is having trouble sleeping, take action today. Protecting Toddlers from Window FallsWhy Isn’t My Child Learning to Share and Take Turns?